In this country, there are few ideals we hold to be greater than our belief in a fair and impartial judiciary system. Here at the Ajo Justice Court it is our goal to provide justice in a fair and expedient manner, with courtesy and professionalism. We - judge and staff - are committed to helping those in their quest for justice through our system. The Justice Court system in Arizona (also known as the Court of Limited Jurisdiction) is the Court of first resort for most people in civil actions. Most people know the Court as the place where they pay their traffic fine. The Ajo Justice Court's geographical area of jurisdiction is one of the largest in the state of Arizona. The state's Justice Courts have grown in their reach and now cover many areas of the law. The U.S. Department Of State fee for passport books for adults is $110.00. The U.S. Department Of State fee for passport books for minors (under age 16) is $80.00. Effective April 2, 2018, the Ajo Justice Court processing fee is $35.00. The U.S. Department Of State fee for passport cards for adults is $30.00. The U.S. Department Of State fee for passport cards for minors (under age 16) is $15.00. Effective April 2, 2018, the Ajo Justice Court processing fee is $35.00. IMPORTANT NOTICE: A check or money order is required for payment to the U.S. Department Of State for your passport book/card and a separate payment is required in the form of cash, credit card or money order for the Ajo Justice Court processing fee. Passport applications are accepted between the hours of 9am and 4pm at Ajo Justice Court, 111 La Mina Avenue, Ajo Az 85321. Please call (520) 387-7684 to make an appointment. You may apply for a marriage license Monday - Friday 8:30 a.m. - 4:30 p.m. at the Ajo Justice Court or at Pima County Superior Court. Two (2) forms of identification (one of them must bear a picture), Passport or Military I.D. The age of legal consent is 18 years. If you appear to be under 21, clerks may request proof of age, so please bring a Birth Certificate, Baptismal Certificate, Passport, or Military I.D. - An emancipation order pursuant to Title 12, Chapter 15, or from a court in another state. Marriage by minors under the age of 16 is prohibited by Arizona Law. No blood test or waiting period is required by the State of Arizona for a marriage license application. The license is valid for 12 months from the date it is issued. After 12 months, it expires. Your license issued by our office can be used anywhere in Arizona during those 12 months. If one of the parties is incarcerated, the incarcerated applicant must have his/her signature notarized on the application. The second applicant should then bring the notarized application with them to the courthouse, so the license can be issued. Obtaining the marriage license does not mean that you are married. A Justice of the Peace, clergy, or other authorized person under the law of Arizona A.R.S. 25-124, must officiate the wedding ceremony and sign the license for you to be legally married. To schedule a date for your wedding at the Ajo Justice Court or to request a private wedding at another location, please call us (520) 387-7684. Private weddings may require an additional fee. Congratulations and best wishes on your upcoming marriage! Sit quietly in the courtroom whenever Court is in sesión. The proceedings are being recorded and any background noise may interfere with the quality of the digital record. Please keep conversation during Court sessions to a mínimum. Set all electronic devices (cell phones, etc.) on quiet mode. No visual recording is permitted without permission of the Court. Smoking is prohibited by law in all areas of government buildings. T-shirts or other clothing that carry offensive slogans or pictures are not allowed in the courtroom. Hats must be removed in the courtroom. If small children are brought into the courtroom, please monitor their behavior. Parents may be asked to leave with their children if the child becomes noisy, unruly, or distracting. Other than business transacted at the entry Service counter, you must pass through Security before proceeding to the Court room or any office in the Courthouse. This includes the basement level. All belongings are subject to search. Security will determine which ítems or materials may be brought into the Courthouse. Inappropriate behavior in the Courthouse may result in being directed by Security and/or the Pima County Sheriff's Office to leave the Courthouse. Courthouse activities are monitored by video camera 24/7. President Abraham Lincoln officially made Arizona a Territory on February 24, 1863. Judges were appointed, criminal and civil codes written up under the Howell code which became effective November 10, 1864. Courts were established in Prescott, Tucson and Phoenix. At the turn of the century, county-based deputy sheriffs in the Territory furnished law and order, and Ajo-related cases were heard in Tucson. When Arizona achieved Statehood in 1912, there were three operative courts of justice: the Justice Court, the Superior Court, and the state Supreme Court. Pima County Superior Court staff regularly traveled to Ajo. The community of Ajo was first established on land that later became part of the expansion of the open pit mine. As the mine grew, Ajo's shape changed. The center of its present-day layout began in 1916 coincident to the opening of a smelter and the evolution to large-scale copper mining by the New Cornelia mining interests, which later became the Phelps Dodge Corporation. A new, model town was designed north of the mine's original location with a central plaza, stores, a hospital, hotels, paved streets, supplied water and sewage systems, a bank, jail, and courthouse. Until the closing of the mine in 1985, the town was largely company-owned. In 2007, Phelps Dodge merged with Freeport-MacMoRan. o's Courthouse has occupied a number of locales in the course of the century, according to anecdotal histories. Following Statehood, when the south side of the Plaza was completed, the Ajo Court was located on the second floor at the west end, directly east of the Valley National Bank and adjacent to the first Ajo branch library. It was later moved to Pajaro Street, across from the present location of the Ajo Copper News. In the 1920s Pima County Superior Court regularly flew to Ajo. From left to right: Bell D. Hall, Clerk of the Court; an unidentified Court reporter; Judge Gerald Jones; Louis Kemp, and Charles Mayse. 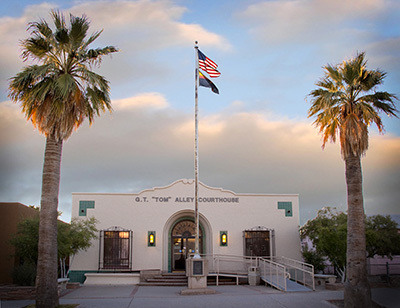 What is now the Ajo Justice Court was built in 1949-50 as the Pima County Building, and it housed numerous county departments including the court during the following 50 years. In 2001, the courthouse was dedicated to the memory of G.T. "Tom" Alley, an Ajo businessman and investor who served on the Pima County Board of Supervisors from 1943 to 1950, and in the Arizona House of Representatives from 1972 to 1976. Available - again anecdotal - records note that there have been 23 Justices of the Peace in Ajo since 1914. Less than half of these - 11 - have been elected. The rest were appointed on the death, removal, or absence of the then office-holder. In proximate order, these judges are: E. H. Johnson, C. G. Puffer, G. H. Mairs, A.H. D. Barr, Frank K. Edinborough, Ellis Malone, T. R. Fields, E.L. Franck, J.S. Wood, James V. Brooks, M.E. Gibson, Alfred Clay Edwards, Essie Edwards, J.N. Chapman, Brady Byers, Noal Talley, M.F. Anderson, James E. Douglass, Helen Gilmartin, John Casey, Maria Alvillar, Walter U. Weber, and John Peck. What do I do if I miss my court date? If you miss your court date call the court immediately at (520) 387-7684. Do I have to appear on my court date for my civil traffic violation if I am going to pay the fine? No. You may come in anytime up to your scheduled date to pay your ticket or contact the court by phone to resolve the citation. Bring your copy of the citation with you. Can I take advantage of the Defensive Driving program for an Arizona citation if I live out-of-state? You may do your school online by going to: http://www.azdrive.com. Otherwise, if you wish to attend out-of-state, call: 1-888-334-5565 for a list of certified schools in Arizona. Out-of-state residents must contact a certified Arizona traffic school in order for the class to be accepted. One of these schools can coordinate your attendance in your state. Can I have an extension for driving school or to provide proof of insurance or registration? Yes. The Court can grant you a 30-day extension. You must contact the Court on or before your original court date for permission. Driving school must be completed 7 days prior to your court date. Contact the Court via phone or in person for ONE extension. Why is the amount that I owe more than what is listed on the fine schedule? If you failed to take any action on your ticket on or before your scheduled court date, the Court enters a default judgment against you and must add a Time Payment Fee. If the Court has ordered your license suspended by Motor Vehicles Department, an additional fee may be added. A Court Automation fee is assessed to all civil traffic citations that are issued (County Ordinance 2008-69). Can I make payments on a past due ticket that has caused my license to be suspended? Yes, but the Court will not lift the suspension until the ticket is paid in full. Do I have to appear at my arraignment or any other scheduled hearing? Yes. You must appear at all court hearings including your arraignment in criminal violations. Also, in criminal violations a warrant could issue if you fail to appear. Visit the Case Information section in this website for additional information. How do I know how many points are on my driver's license? The amount of points depends on the violations. For this information, please contact Motor Vehicle Department (MVD) at: http://www.azdot.gov/mvd/contact.asp. Provide your full name, date of birth, and driver license number. Contact the Court as soon as possible to see the judge. You also may pay a bail/bond at the Pima County Jail and will be given a new court date. Please, contact the court by telephone or in person. Please, see the Wedding License link in this website for additional information and to download the worksheet.